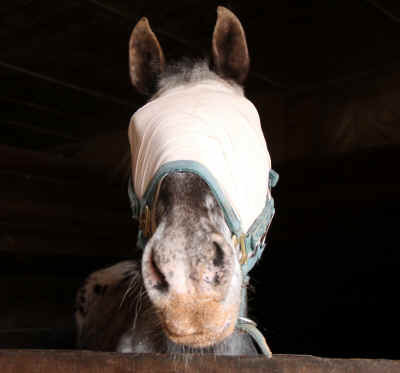 Buddy was surrendered to Catskill Animal Sanctuary six years ago because, as a newly-blind horse with explosive and unpredictable panic attacks, he was too much for his family to care for. But if you've ever had the pleasure of meeting this goofy, energetic boy, you know that his blindness doesn't keep him from enjoying life to the fullest! In 2009, Buddy's right eye was surgically removed in order to rid him of excruciating pain caused by increasing pressure behind the eyeball. In recent months, the same condition impacted the left eye, so, just last week, that eye was removed. This second successful surgery will enable Buddy to live pain-free for the rest of his days. This recovery is a little slower than the first, but Buddy will soon be back to his playful ways and reunited with his beloved Sioux.